Do you want to heat your pool using only solar energy? Would you rather complete the installation of your solar pool heater yourself, instead of paying to have it installed? Then read on to see how you can install a fully solar pool heating system all on your own! The very first thing you want to do is find and acquire all of the necessary components for your solar pool heater. There are generally four parts to a solar pool heating system, which are listed with explanations below. The solar collector: This component is a device that circulates your pool water to be heated directly by the sun. The solar collector is usually a simple network of pipes attached to solar panels. Collectors come glazed (with a glass covering) or unglazed. Unglazed collectors are much less expensive than glazed, but are less efficient in very cold temperatures. Unless you’re planning to swim in temperatures below freezing, unglazed collectors will most likely be sufficient. You need to figure out what size your solar collector needs to be to adequately heat your pool. You can easily calculate the optimal size of your solar collector by using this handy tool. The filter: Chances are, if you’ve got an in-ground or sizable above-ground pool, you already have the filter. The filter is needed to remove any debris from the pool water before it enters the solar collector. You don’t want a clogged collector! The pump: Again, you most likely already have a pool pump. This is how the water is transported into the solar collector to be heated. The flow control valve: The flow control valve diverts water through the solar collector. You can get a flow control valve with a sensor to automatically divert the water if the temperature inside the collector is higher than the pool temperature. If the temperature of the pool and collector are similar, the water will simply be directed back into the pool. Or, you can get a manual valve and simply switch it “on” when the pool feels chilly. Once you figure out how big your solar collector needs to be, it’s time to start researching specific solar pool heaters. You want to look at several separate solar pool heating systems to make sure you’re getting the best quality and value for your purposes. One specification to look at is system efficiency. How much of the energy collected by the system is converted into heat? How much goes to waste? You can find out this information by looking at the product specifications. You’re looking for “UL,” which is the overall heat loss coefficiency. Simply put, the lower this value, the more efficient the solar collector is. Or, if you cannot find the heat loss coefficiency for a particular model or you are building your own collector, you can use this tool to calculate the efficiency yourself. Once you’ve narrowed your options down to the most efficient solar pool heater systems, think about the cost of each one. Quality is important, but will you see a return on your investment within a timeframe acceptable to you? Consider your current heating and electricity costs along with the cost of purchasing and installing the solar pool heater. Now that you’ve selected and purchased your solar pool heater, it’s time to get down to business! 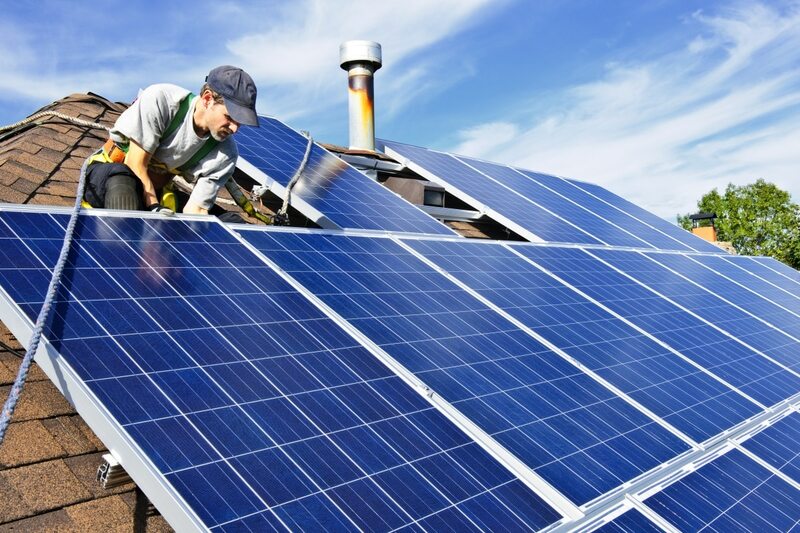 Most solar vendors will recommend that you have a qualified contractor install your system. If you’d rather go the DIY route, we’ve included a brief overview of the installation process. This should not be considered or used as a specific step-by-step instruction. It is for informational purposes only, to give you an idea of what you’ll be getting yourself into if you decide on DIY installation. Here are the general steps you’ll cover while installing a solar pool heater. Get the solar collectors to the roof, ideally on a south-facing slope. You may also want to mount your solar collectors on a fence, rack, shed, etc. Either way, you want to start the process with the collectors already positioned where they will remain after assembly. Connect each solar panel using couplers over the collector headers. Secure each connection with clamps. Attach mounting clips to the solar collectors and the roof. This is the part where you will attach the solar collector to your roof, so take care to make it secure! Attach straps and tie-downs. These are an added defense against high winds. Install the piping that runs between the solar collectors and the pool pump. Make sure you maintain roughly equal lengths for the intake and return pipes. The distance for water to travel to each collector should be the same. Integrate the pipes right into your existing pool pumping system. This should require only minor changes to your current plumbing. Install the flow control valve and controller, if you are using an automatic system. This may require the help of an electrician. Mount all sensors, if you are using them. Familiarize yourself with all of your valves and sensors! Use a solar pool cover! It doesn’t make sense to let all of that free heat go to waste through evaporation and dispersion! Make sure you also invest in a good solar pool cover to help maintain your pool’s temperature. You can find our favorites here.